Cataracts are defined as an opacity of the lens. The lens is located behind the iris (the colored part of the eye) and is used to focus light onto the retina. When a cataract develops, the light becomes scattered onto the retina. This causes distorted vision in the early stages (similar to looking thru a shower curtain) and severe impairment in later stages. 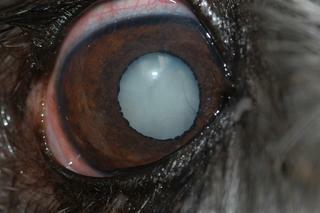 Cataracts are removed by Phacoemulsification, which is also utilized in the human field. A small needle is inserted into the eye thru a small incision. This needle emits ultrasonic vibrations that break up the cataract. 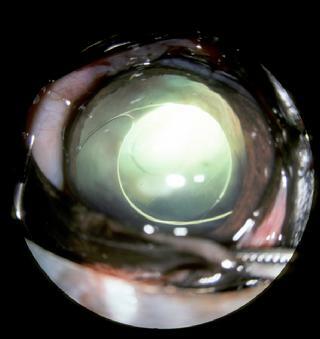 Once the cataract is fragmented, it is vacuumed from the eye thru the same needle. After the cataract is removed, a prosthetic lens is inserted. This new lens restores normal vision. How long will by pet be hospitalized after surgery? Cataract surgery is an outpatient procedure. Most of our patients are ready to go home by one o'clock in the afternoon. How soon will my pet see after surgery? Patients typically resume functional vision immediately after surgery and their visual acuity increases significantly for approximately two weeks.